As media playback formats increase the need for faster MicroSD cards has increased. With 2K/4K video playback and burst mode (Continuous still images on on DSLR cameras) older MicroSD cards just can’t keep up with todays needs. Face it most people going into your local mass merchandise store looks at MicroSD cards and the lowest price highest capacity is usually what ends up in the shopping cart. Often those are Class 4 MicroSD and only required to run at 4 MB/s minimum which is a pretty abysmal speed by today’s standards, only recommended for up to 720p playback. Fast forward to today’s 2K/4K needs and you will need to go to UHS class 10 running at 45 MB/s read 10 MB/s write which is still pretty slow on the write end of flash storage (HD and Burst Mode Photography but not 4K/2K). If you don’t mind spending a dollar or two more you can get a UHS-I Speed Class 3 (U3) that runs at 90 MB/s read 90 MB/s write and fully capable of supporting 2K/4K playback. 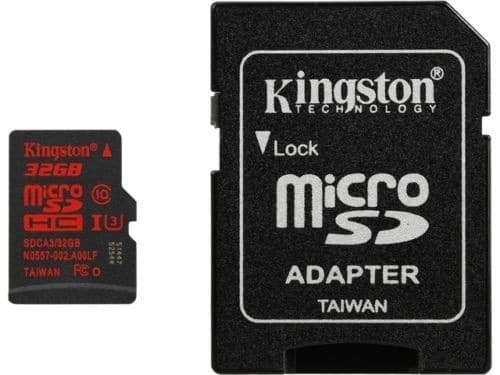 Kingston has long been known for their memory products including microSD. 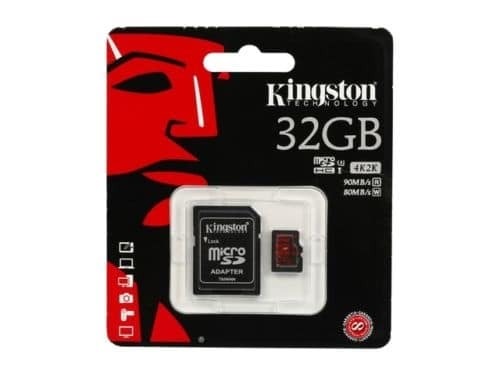 If you are looking to increase the speed of that new DSLR camera or playback 2K/4K video you will be hard pressed to find a better or faster Micro SD than the Kingston 32GB UHS-1 U3 microSDHC card. Running at 90 MB/s read and 80 MB/s write. Sold on hand card with a simple plastic clam shell the speed specifications and 4K/2K capabilities are listed on the outer packaging. If anything Kingston was a little to modest in their packaging and needs to make the speed capabilities in larger print to differentiate from the crowd on store shelves. Sold in three sizes available are 32 GB, 64 GB and a whopping 128 GB. The price sweet spot is in the 32 and 64 GB varieties with our 32 GB SD card costs a mere $16.95 (as of publishing) and well worth the extra few dollars it costs more than slower microSD cards. Getting to the 128 GB card and you pay a premium for massive storage and the cost skyrockets to just over $100. If you absolutely have to have large storage in a microSD form for drone cameras or video recording the $100 price tag shouldn’t be much of a put off. Included in the kit is a SD adapter which is pretty standard but you can still buy just the microSD card by itself but if you’ve ever hunted for a microSD adapter we would recommend getting the adapter and squirreling it away for your next adapter hunt. 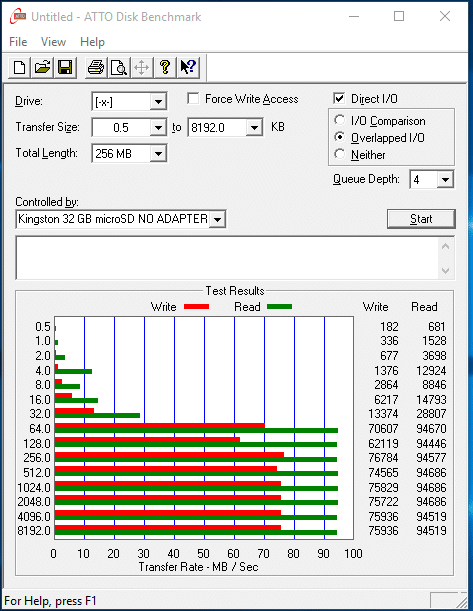 To test the Kingston (SDCA3/32GB) 32 GB microSD card we used a Core I7 5920K socket 2011v3 system which is Intel’s current HEDT (High End Desk Top) as of the penning of this article (Mar 2016). In order to test the card at it’s full speed you will need a USB 3.0 or USB 3.1 media reader. The USB 3.1 readers are rare and more expensive but a good USB 3.0 media reader runs in the $20 dollar range. Our Kingston USB 3.0 Media Reader (FCR-HS4) requires a USB 3.0 port on your computer and reads Compact Flash Type 1 & 2 (yes Compact flash is still commonly used),SD, microSDHC (SD High Capacity), microSDXC (SD Extended Capacity. ), Memory Stick PRO and Duo/PRO which should cover most modern forms of camera and cellphone storage formats. In case you notice it takes a considerable amount of time to read or write data, you might want to put it to the test and see if everything is in order. ATTO Disk Benchmark is a software solution designed to help you measure the performance of your system, by running a series of tests to determine hard disk speed. ATTO is almost the industry standard for reporting drive speed from the manufacturer and we will be running multiple passes of ATTO to check on the learning portion of the SSD. 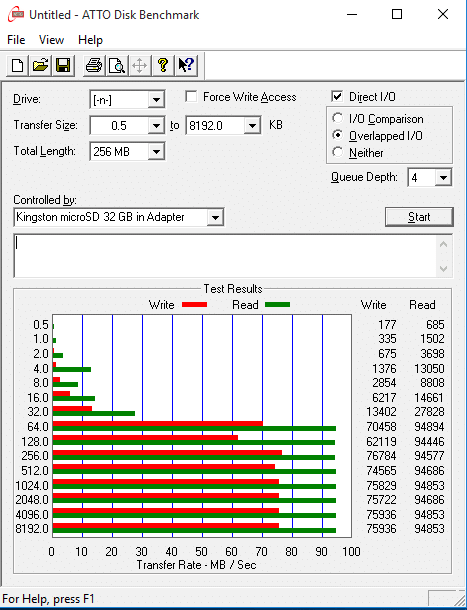 We first tested the Kingston (SDCA3/32GB) 32 GB microSDHC card in the SD adapter to ensure that it wasn’t going to slow the microSD card down and were rewarded with 94.853 MB/s read and 76.784 MB/s write. Testing the microSD card with no adapter yields the same results (approx) hitting 94.686 MB/s read and 76.784 MB/s write which is above the read specifications given by Kingston but a hair low on the wrote side. 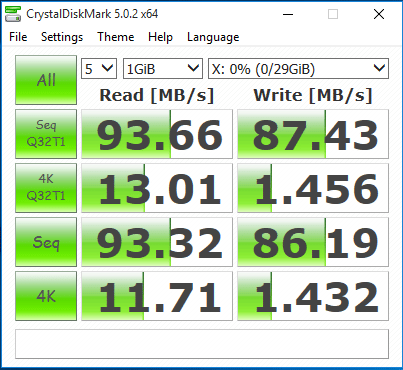 CrystalDiskMark is a disk benchmark software.It measure sequential reads/writes speed,measure random 512KB, 4KB, 4KB (Queue Depth=32) reads/writes speed,select test data (Random, 0Fill, 1Fill),provide theme support and Multi-Language support. CrystalDiskMark confirms the advertised speed specification of 90 MB/s read and 80 MB/s write and we even got a few MB/s above the specifications so our Kingston (SDCA3/32GB) 32 GB microSDHC card is good to go. (U3). The difference in speeds is tremendous with a Class 4 only having to run at 4 MB/s or faster and a class 10 at 90 MB/s read and 45 MB/s write while the Class U3 Kingston (SDCA3/32GB) 32 GB microSDHC card runs at 90 MB/s read and 80 MB/s write. We are all tempted to keep that dollar or two in our pocket but in most cases it’s better to spend that small investment in future proofing so we would urge you to look for and purchase a Class U3 microSD. 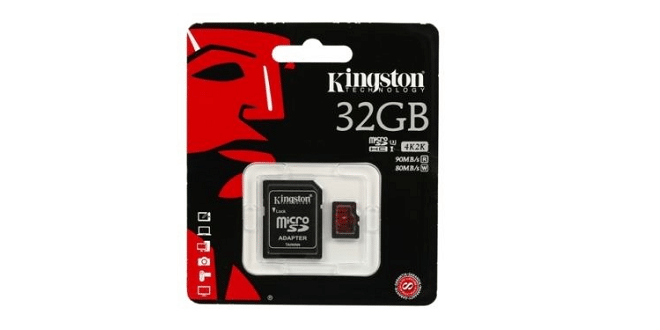 If you need or rave the extra speed offered by the Kingston (SDCA3/32GB) 32 GB microSD card you won’t have buyers remorse or have to go out of pocket in a month or two when you upgrade your devices. 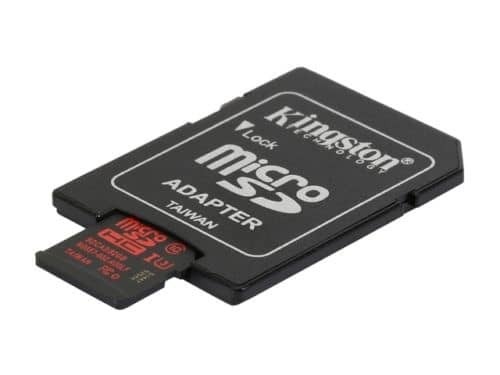 We highly recommend the Kingston (SDCA3/32GB) 32 GB microSDHC card for it’s speed and it’s small $13.99 price. If you need or crave the highest class speed microSD then the Kingston (SDCA3/32GB) 32 GB microSD card is hard to beat for speed or price!